I’m not sure what the actual definition of “Certifiably Insane” is, but I think that Plaintiff is either really close or has already gone over the edge. I got a text message from her recently telling me to check my email. Thinking that the world must surely be coming to an end, and being the kind, caring, thoughtful, loving husband that I am – I dropped everything and ran to check my email. 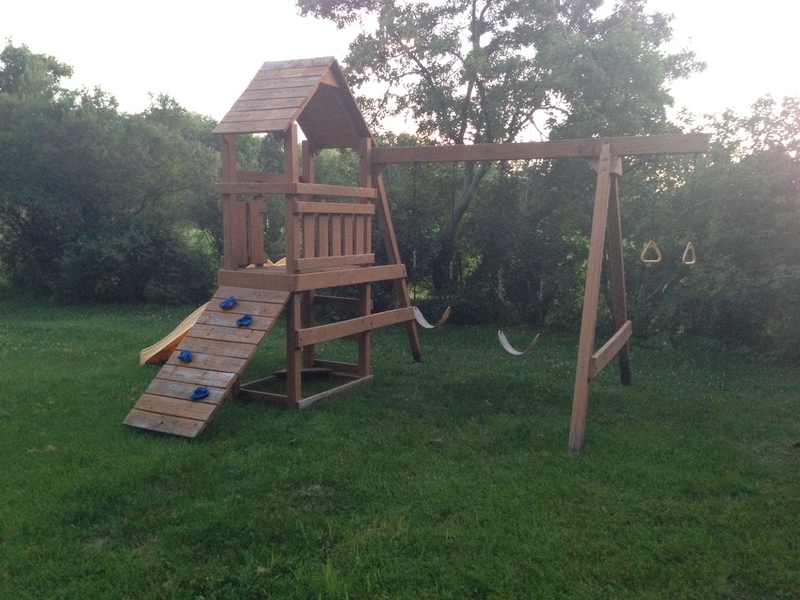 There I found a message from my beloved spouse with the information for a swing set that was for sale by a friend of one of Plaintiff’s co-workers. 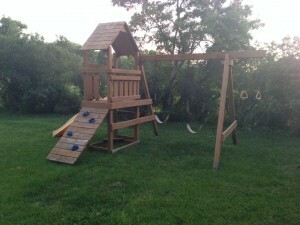 Now a sane person would logically ask, “Why do I need a swing set?”. Being a sane person, that is exactly what I asked plaintiff, via text message. Her response was simple. For “Her Highness”. Well that makes sense. How come it didn’t dawn on me. How could I not realize that every four month old infant needs a full jungle gym swing set complete with slide, rock climbing wall, and climbing rope? Silly me. Of course, we’ll also need it just in case our eldest comes up with her beloved family, and there is her highness the ex-crown princess and her future family who may or may not ever come visit us. Of course. It’s as plain as the nose on my face. How could I of missed it. Why didn’t I think of finding a new jungle gym on craigslist? So, she schedules a drive by for right after work…. we go, she writes the check, and we go home with a wood jungle gym following behind us to our home. The neighbors, who know that we have recently added our first grandchild to the family, and that she is just over four months old now think that not only is Plaintiff certifiably insane, but they probably think that I’m either leading the parade or following right behind. Jungle Gym Insanity! Just what a four month old needs! No matter. We have the jungle gym ready for Charlie’s next visit. I’ve got to get ahead of Plaintiff – she’s going to get the brownie points for this one…. Thinking ahead, I’ve got a landscape guy coming out to plot out the course for the lazy river and I’m trying to find an Engineer to help layout the new roller coaster ride. Hi there can you mind letting me know which webhost you’re using? to admit this blog loads a whole lot quicker then most. Is it possible to recommend an excellent hosting provider at the reasonable price? We’re hosted on Hostgator… Glad to hear it loads quickly. 4 emails with the same comment. Perhaps there is certainly a means it is possible to remove me from that service? you are generally an excellent author. I am going to be sure you bookmark your website and certainly will keep coming back eventually. your great posts, have got a nice weekend!